Franklin Avenue: Clifton's Closes Its Cafeteria; Will Food Ever Return to the Downtown Landmark? A friend alerted me this weekend that downtown's Clifton's Cafeteria is closed for food service, and is currently only operating as a nightclub. That's quite a bummer — it's always a fun spot to bring the kids and visitors, to explore the forest-themed environs on the first floor. It was the start place for the Great Los Angeles Walk in 2015, and was the perfect place for the "Twin Peaks" premiere party in 2017. Opened in 1935 as Clifton's Brookdale, we visited the forest-themed eatery several times before new owner Andrew Meieran (who previously created downtown's famed Edison bar) shut it down for what was supposed to be a brief renovation in 2011. Cut to nearly five years later, and rebuilding Clifton's became a labor of love for Meieran, who has kept the fun and the kitsch but added so much more to the place. 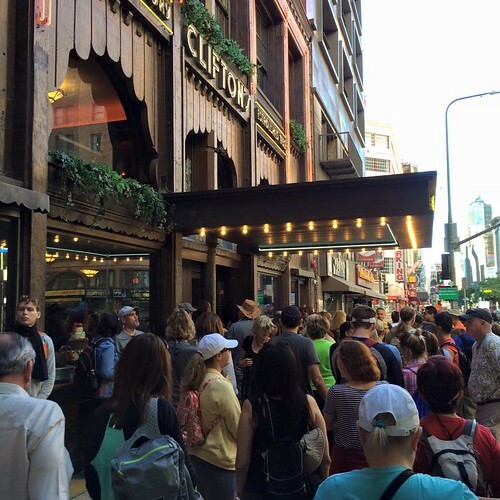 Clifton's finally re-opened in 2015. 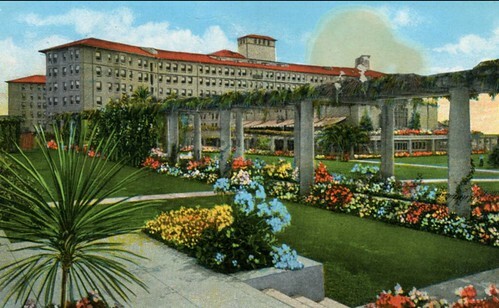 Clifton's original famous slogan, of course, was "Pay What You Wish, Dine Free Unless Delighted." Perhaps not enough folks were delighted with the updated cafeteria. I asked Chris Nichols via Twitter what he knew about the shut-down cafeteria portion of Clifton's, and he wrote back: "I also miss eating at Clifton’s. This just in from the owner: 'food is definitely coming back— pretty soon if anyone asks.'" 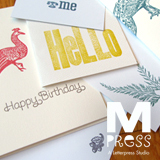 Unfortunately we’re closed today as we complete our Exposition Marketplace. We look forward to seeing you soon and to a year of extraordinary endeavors! Our Marketplace will feature an array of historic offerings and traditional favorites as well as amazing new classics! Stay tuned -- but here's hoping we'll be dining under the trees once again soon. It is a really fun spot. Maybe they need a better menu? This remarkable statement could refer to almost anything (food, souvenirs, books): "Our Marketplace will feature an array of historic offerings and traditional favorites as well as amazing new classics!" I mean to be honest their food is horrendous. And I love cafeteria-style diners! Much room for improvement. Hope they really elevate what's being served. We absolutely love the tiki bar and the ambiance in general. the community), so is Clifton's. I happened upon their closure recently when I tried to take my Australian friend there during lunch time. Yes, the food was terrible, but it was such an amazing place and fun to take out of town guests there. Just stick to the bar and you would be fine. Sad. Cliftons died when they got rid of all the old recipes. The new stuff was horrible and overpriced. And the bakery!!!! Gone are decades of traditions after the horrible re-imagining! Pick and Mix and Match cafeteria was why I liked Clifton's so much. The ability to "build your own meal" based upon food that you actually SEE is EXTREMELY important. Reasonably priced for cafeteria food is also important. Cafeteria people don't like the hidden "surprise me" food schlepped by overpaid waiters. how can you have "new classics"??? Cliftons died when they got rid of all the old recipes. The new stuff was overpriced. And the bakery!!!! Gone are decades of traditions! So sad! I was excited to go there when they reopened, but reviews were so bad that I stayed away. Stories of chaotic organization, sky-high prices, and poor food. I think they needed better management to make a success of it. I hope they do succeed with whatever changes they're implementing! They would still be open for dining if the food was more palatable. As it was one needed clothe pin to pinch our noses to eat their food. I really wanted the Cafeteria to be successful, but how could it succeed if their cooks and food were on par with jails. You'd probably eat better in a public school cafeteria. Why not use the old recipes that everyone loved? The food at the original was terrible. People remembering it fondly are just wearing rose tinted glasses or have mediocre palates. Unfortunately the food at the new Clifton’s was every bit as bad. Thankfully everything else about it is fantastic. Maybe they’ll fix the food this next go round. WOW! I can’t believe the comments on here about this place . My grandmother would take me to go eat lunch there it was really nice place it’s sad that they change Clifton’s it was a nice place to go eat lunch. To bad they didn’t keep it the way it was before so sad. Maybe they should get chef Gordon to help them with There menú . The "Marketplace" is what they call the cafeteria. It sounds like they are only making changes to it. They, like many "diner" type restaurants have recently reduced their hours to their peak time. I went with a group of friends a while back and it was not very good, not a place I would tell anyone to visit for good food, it was just like an old funky museum and it looked like the good stuff had been looted. I don't think this type of operation can make a go of it anymore. As one who has had the pleasure of eating at this location for most of my 4 score years, I feel that it should be preserved in the present form. It is a landmark and a symbol of great times. The food at the old Clifton's, albeit not gourmet, was simple, honest and affordable. Went once after the re-opening to eat some dessicated overpriced scraps with a distinct eau de Frigidaire, and never returned.